Yemen is a magical place. The poorest country in the Arabian Peninsula is also a cultural treasure forgotten by time. In Yemen you will find surreal landscapes, a unique architecture mud brick “skyscrapers” and an authentic Islamic culture. An arid mountainous land that extends to the warm rich waters of the Red Sea to the west and a vast coastline in the Arabic Sea and Indian Ocean in the south including several islands. Unfortunately this beautiful country, after a long period of political instability, is currently at the mercy of a bloody civil war and a major humanitarian crisis. The trip to Yemen has never been safe due to kidnappings and terrorist attacks. Now, it’s just impossible. You may think that the Yemenis are carved out of the same hard rock of their land. Stranded in this mountainous land and absorbed by their strict religious traditions, at first impression they seem strict and distant people. Their appearance follows the rules of men wearing their white robes or a kind of “skirt” and carrying the jambiya, the traditional inclined sword, while all women wear the pitch black nihab leaving exposed only the eyes. And of course the frantic use of the stimulant plant named “qat” filling their mouths. Apart from the first impressions, the Yemenis are very friendly, polite, proud, hospitable and above all honest. Qat is a plant with a mild psychoactive effect, a stimulant and also a social habit. And while it is forbidden in the rest of the world, in Yemen, Somalia and some parts of Ethiopia it’s a daily habit. The herb has different varieties and prices, and one has to chew for hours, sufficient amount of vegetable pulp in cheek to feel some impact. However, except from it’s commerce value, it’s a scourge for this poor people consuming daily a large part of their income for this unhealthy habit. From noon onwards all the men and also women under the cover of nihau, engage in the consumption filling their cheek and spitting excess salivation. The old city of capital Sana’a spreads like embroidery on a plateau of a 2.300m altitude. The Sana’a is an ancient city, one of the oldest continuously inhabited cities since the biblical years and according to legend the founder is Noah son. The Sana’a is a UNESCO world heritage with an architecture that, like most cities of the country, is characterized by impressive multi-storey brick or stone towers, decorated with masterfully white arabesque patterns. In the narrow alleys of old town, one finds many outdoor markets with vegetables, spices, qat and … although now banned, even weapons components. 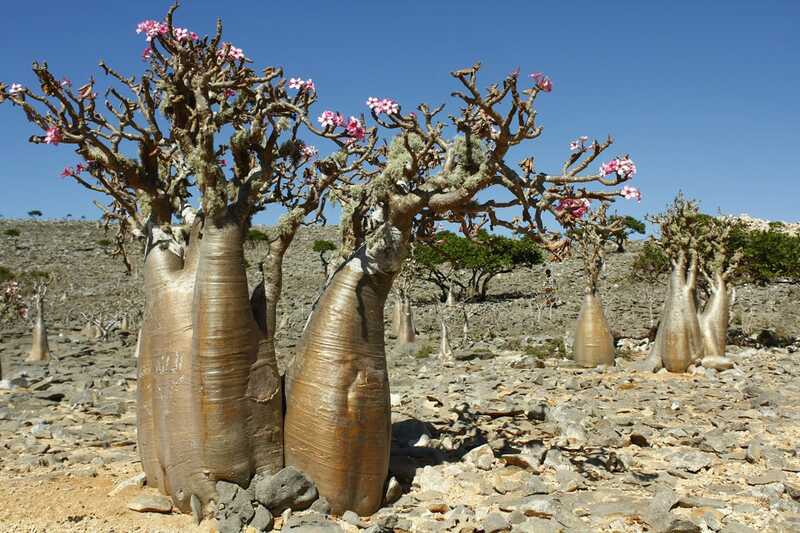 Socotra and the three smaller adjacent islands are an “alien” landscape lost in the Indian Ocean. The isolation of the island, situated a long distance from the Arabian Peninsula and Africa, has led to a unique evolutionary path. In this treasure of biodiversity with over 700 species of native flora, one finds trees plucked from science fiction. 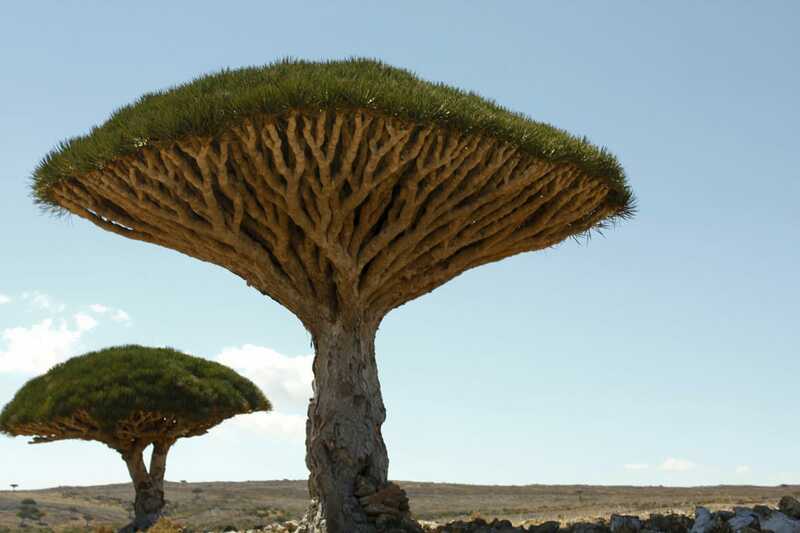 Dragon blood tree, Bottle tree, Cucumber tree, are just a few of the unreal creatures of the vegetable kingdom. 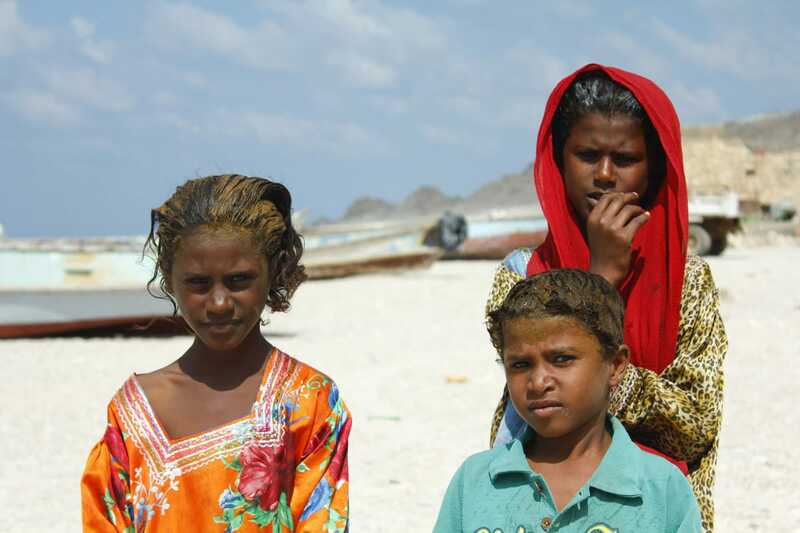 In Socotra live about 50,000 inhabitants who speak the local dialect Soqotri. Some of the cities within 2-3 day distance from the capital. This was the limit for tourism visits, since the civil unrest had already started. To “Manhattan of the desert” with brick skyscrapers that unfortunately was already closed to visitors. A few hours flight from snowcapped Istanbul and the plane is landing just after midnight on the ground of this Arab country. The first thing we see is a group of women dressed in black, heading like ghosts to the dim lit arrivals hall for customs control. I try to communicate by sms with the person who has arranged for our visas, holding on me some papers with Arabic text and the emblem of the Yemen republic. It is the second time I try to visit the country and a visa failure hopefully will not be repeated. Eventually the man appears behind one door. There’s a… little problem with the visa! Not something important, as we get assured by some people of unknown position. The pre-approval numbers do not correspond to the visa numbers. To avoid waiting for hours until dawn to solve the issue they propose to leave our passports there! It is an inviolable rule to not surrender your travel documents. Let alone to give them to strangers, in a country in a semi-war state, with strict laws, with army roadblocks on the streets… How can we get into this country without a passport? Eventually sleepiness prevailed logic. We take the road to the city without any document in our hands except a scrap with a phone number of some person of unknown position. On the way there were indeed army roadblocks but luckily they did not stop us. We arrive in a totally dark city that looked tremendous through the narrow alleys and the tall brick buildings. There is an electricity blackout in Sana’a. The Dawood Hotel, which I’m not sure if nowadays survives the bombings, is a seven floor 17th century tower and one of the few still in operation in the old town. “Climbing” the steep stairs of the very narrow staircase and carrying my heavy bag was another fun challenge. Rooms resemble to the tales of the 1001 nights, completed by the view of the dark city. Under the candle lights and my sleepy eyes, I will enjoy the full image of the traditional room with the carpets, the colored glass of the tiny windows, the hammered bronze tables and the old woodwork furniture. Only in the morning when the sun rises, the beauty of this place is revealed. Sana’a spreads like a lace beneath the unobstructed view on the terrace of the small hotel. The beige mud with white embroidery of limestone, the minarets of mosques and the mountains rising in the background of the plateau create a spectacle that leaves me astonished. My anxiety for the passport make me abandon the unique view and climb down the seven floor stairs. Fortunately passports were there along with the precious visa sticker. Breakfast in Yemen is rich. Fresh bread, honey, some types of omelet with tomato, liver etc. Out in the city streets admiring the embroidered with ornate limestone lace, high buildings of the walled city. This beautiful country unfortunately has never been safe and kidnappings of foreign citizens were not uncommon in previous years. The captors usually demanded some political favors from the government, releasing their victims after an “accommodation” period. But recently the situation has changed dangerously after political instability and bloody attacks on foreign tourists occurred. We were not aware while walking in the streets of Sana’a, in the bustling central Tahrir square where we exchanged currency at the bank, that just two days before three foreign nationals were kidnapped, in the middle of the day, in front of the eyes of the crowd. From what I read, they had been left after several months for ransom. Yemen after periods of Ottoman and British colonial rule ended in the 60s in separation of the country into two hostile states. In 1990 it was joined again in the current state but the conflicts between tribes and political parties in this poor country, never calmed down. In addition, paramilitary organizations such as Al Qaeda, eventually lead the country into the bloody civil war that rages to this day and the ensuing humanitarian crisis. On the verge of this tragic fate, we were the only tourists in the capital of this country. Locals were all cheerful, friendly and asking to get photographed, except from women; don’t ever try to take a picture of them. The flea markets of the city are comparable in colors and variety of goods, to any Arab city market. An old man approached me suggesting me to buy his jambiya. He maybe was in need of the few money asked and I had the pleasure to get a souvenir with the beauty of its used condition. The curved sword is an integral element of men’s attire, it’s an item of pride and should remain in its case, otherwise it’s a call for fight. Apart from this weapon, however, some citizens walk around with an AK-47 on their shoulder! Eventually we met a young girl with western characteristics and blonde hair under the head scarf. She felt scared while we approached to ask something, then she apologized for her aloofness under the circumstances. Contrary, we were moving around quite relaxed and sociable to anyone we met. Upon noon, everyone begins to fill their mouth with the mild drug called Qat, an astringent herb that is chewed by men, women under hijab, even children. It gives an effect of relaxation and chatting mood to the users and the country’s pace is slowed down accordingly. Ready for the flight to Socotra island. As we enjoyed our breakfast, my fellow traveler informs me that the taxi we arranged the day before with a non English speaking driver, is waiting for us outside. Without hurry, at some point we decide that time has passed… but… that was not our taxi but another, similar old station wagon. A mistake like that can blow the whole trip. We get running down the main street looking in vain for a taxi. The owner of a shop watching us in despair, asks about. Without a second thought, he closed his shop and offered to take us with his car to the airport. With big relief we are on the plane that will take us to the destination of my dreams. A stopover in the port of Aden, then following a route over the endless almost uninhabited south coast, then another stopover in Mukalla city. The students of an elementary school accompanied by their black veiled teachers entered the plane for a short visit. In the last leg the captain invited us in the cockpit, over the majestic waters of the Arabian sea. 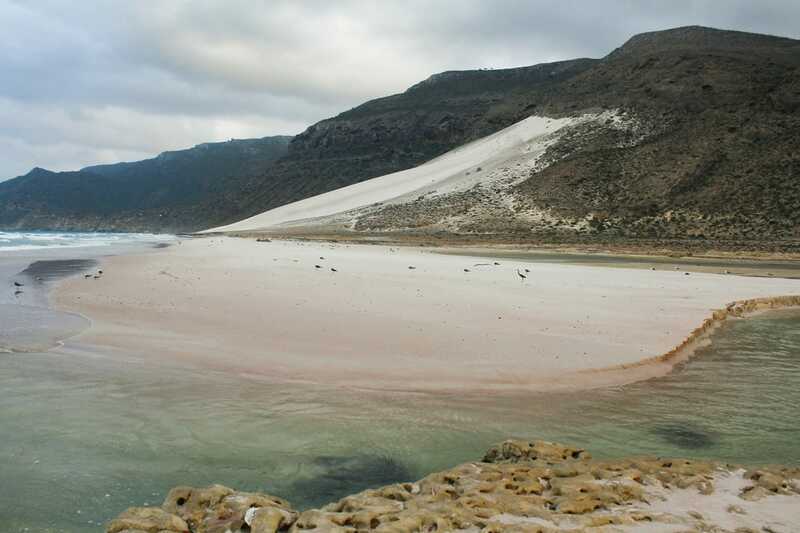 Socotra appears with its otherworldly colors. Saaber, a young Socotran who will be our guide, welcomes us and after a stop for the driver’s Qat supplies, we have lunch with fresh fish in a small shop, with the company of goats drinking coffee !! and Egyptian vultures eating the leftovers. 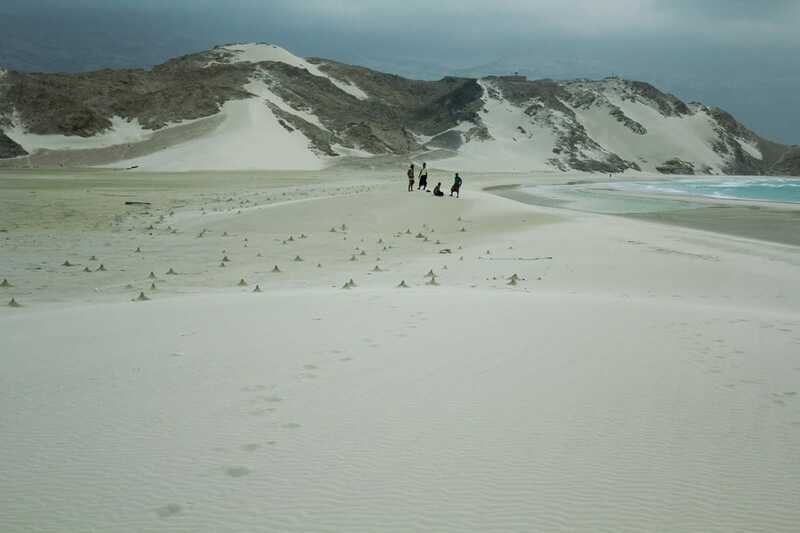 Continuing into the island’s attractions, with sand dunes starting from the sea and reaching the mountain tops, in places of no human presence. Climb there offers amazing views. Our overnight stay will be in free camping, on a different beach every day. The second day’s schedule includes a rough hike to the top of a mountain where there is a large cave with stalactites. The path is overgrown with surreal endemic bottle trees and cucumber trees. Returning tired by the debilitating heat will dive in the rich underwater world of the Indian Ocean. The hikes are continuing on the next few days with more apocalyptic landscapes. Forests of “alien” dragon blood trees, fields of blooming bottle trees, mountain lakes and springs, boat rides in stormy seas until Shouab beach with the turquoise waters, returning to Qalansiya fishing village, passing by the “capital” Hadibo for supplies. 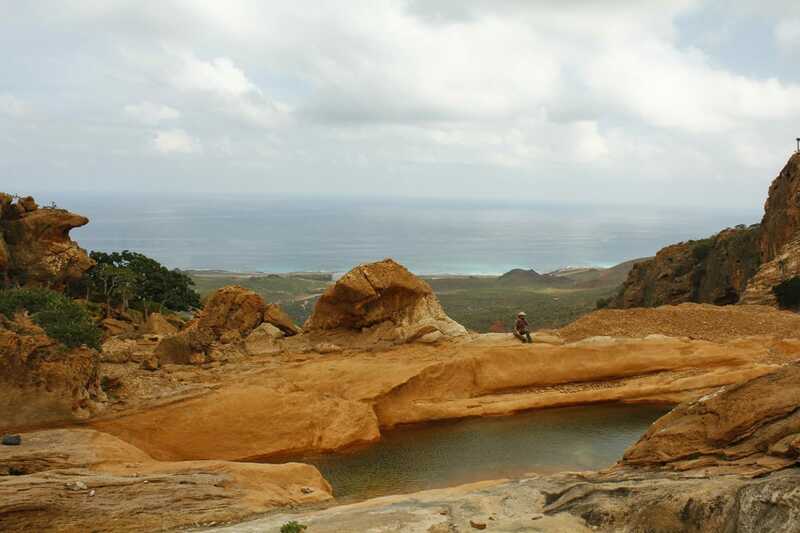 Fresh fish, rice and sweet tea in abundance in the deserted landscapes of the island. In Aomak beach there was some crowd. A group of expatriates in Saudi Arabia, with obvious financial status were enjoyed noble pleasures. We were invited to their carpeted outdoor “palace,” offered plenty of food and tea and camel rides. The fifth and last day on the island revealed another breathtaking landscape. Saaber tells us to close our eyes until we reach the top of a hill. 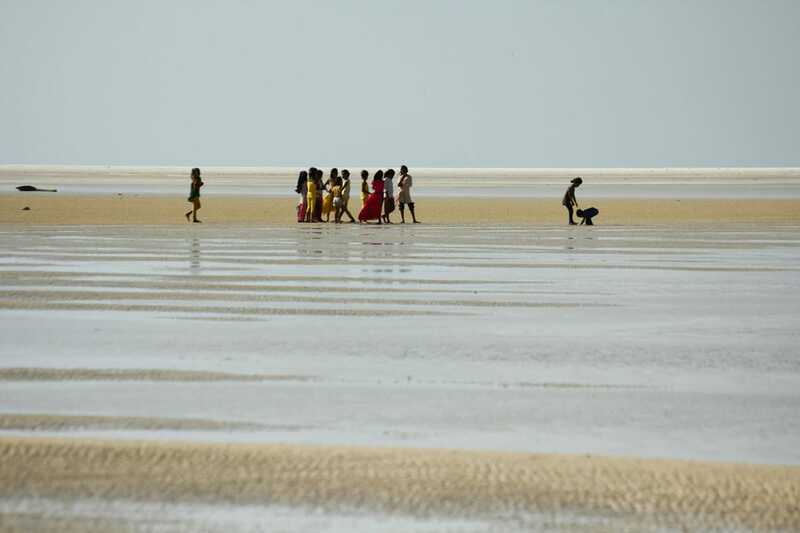 The vast Detwah lagoon stretches imposingly before us with the white sand and the emerald waters playfully under the sun and passing clouds. From my memories of Yemen, the following incident will stay forever. One morning waking up in the camp place, we see the Saaber holding a bunch of crumpled 50 euro banknotes, found scattered in the surrounding bushes. He told us to check whether we had lost money. My fellow traveler discovers that his money belt was torn and all his money was gone. Honesty and kindness of Yemenis was sealed in the name of this boy, living in one of the remotest edge of the world. Returning to Sana’a, we felt bold enough, walking around with much comfort, mistakenly maybe. Surprisingly we met a couple of other tourists… armed escorted! The information that we can visit some other nearby cities made us defy the supposed danger and here we go for a few days trip. The tour must be made with a local guide, rented a vehicle and the necessary permits in multiple copies delivered at each checkpoint in order to check if something goes wrong… in case we disappear. The guide is a highly cultured man, a professor of Spanish at the city’s university. He lived several years in Cuba and Spain, where he was married, but he returned to his homeland and made a family according to local traditions. He said that if something goes wrong, he would put himself in front of any threat to protect us. This self-sacrifice commitment is not quite reassuring, since in such cases it doesn’t matter who’ll go down first. The routes to the mountain villages of Yemen are captivating. Stone villages rising like a natural extension of the arid landscape. Arriving in Manakha, a city with a panoramic view, we walk in the bustling market full of the shocking sight of slaughtered animals. We will enjoy a dinner of dancing and fantastic music from a band playing oud, that came to the hotel just for us. We will continue to the astonishing fortified village of Al Hajjarah. In the narrow alleys, a young girl and her mother invite me in their home. Quite a paradox in a strict Islamic country. I’ve lost visual contact of my companions, but I get the courage to go into a foreign home in such a country. 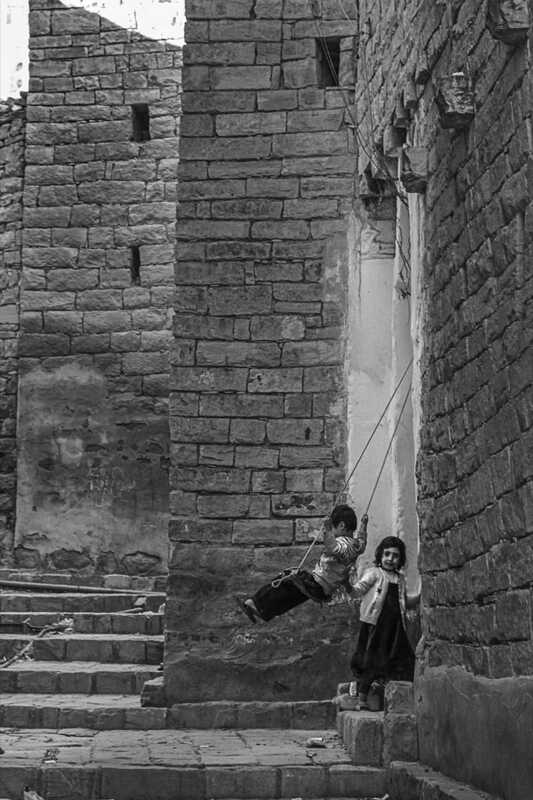 The young girl run to hide from my view, and the old mother winks me to climb on the roof of the narrow staircase. Indeed, the view was breathtaking but i was stressed to get out soon. In the city of Shibam-Kaukabahn a group of children greeted us with joy and laughter. The mischievous leader of the young “gang” dressed in white robe started some bullying on us, yelling anti-American slogans! A strange calm prevailed in the city Thula, as everywhere in the closed societies of Yemen. A family stopped their car and the women, through their -covered to the eyes- outfit, invited us at their home when we’d return to Sana’a. Unfortunately the phone number was probably written wrong and we lost this kind invitation. Returning to the capital we visited the magnificent Grand Mosque, which does not fit much with the poor image of the rest of the country. The New Year of 2013 found us returning from a dinner in one of the few restaurants in town. But the taxi driver asked an unreasonable amount that we refused to give. He began shouting angrily to us, disrupting the tranquility of the neighborhood and attracting people towards us. One of the attendees, a professed cultured young man, gave the money to the taxi driver and was not accepting from us the amount, just another incident that proves the Yemeni hospitality. Despite the unexpected entry of year 2013, we celebrated on the next day with traditional Greek christmas cake -my travel buddy was surprisingly carrying that for all the trip- on the roof terrace with a fabulous view of this mythical land. The trip to one of the most amazing places I’ve ever been reaches to its end as we are waiting for the return flight late in the evening. For budget reasons we did not book a room and had to spend our time sitting and drinking tea in the hotel’s courtyard. The night is cold and we’re unprepared for the unexpected weather. The hotel guys asked us why we’re staying out in the cold instead of resting in a room and we stereotypically replied that we had no money. Immediately they offered us two rooms for free and we shapely accepted one, trying to leave it as we found it. Recalling the memories of magical Yemen, I am sad about the bloody civil war and the subsequent famine that afflicts those troubled people. I wish peace to reign again soon.